House (Hugh Laurie) and Cuddy (Lisa Edelstein)explore their feelings toward each other amid a crisis at the hospital: the threatened loss of its Level 1 status as a trauma center because the only available neurosurgeon (George Wyner) is sick. The diagnosis of the doctor's illness is difficult, but House doesn't offer to help. Meanwhile, Thirteen (Olivia Wilde) has a request for House. A 14-year-old (Alyson Stoner) with a terminally ill brother collapses during a skateboarding competition. Meanwhile, House (Hugh Laurie) and Cuddy (Lisa Edelstein) confront the workplace ramifications of their relationship; and in the clinic, House must deal with an elderly man and his son. A suicidal children's author (Guest star Amy Irving) has a seizure just before trying to kill herself, and House (Hugh Laurie), who's a fan, thinks that the key to both her physical and psychological conditions lies in her latest book. Meanwhile, House and Cuddy (Lisa Edelstein) go on a double date with Wilson (Robert Sean Leonard) and his girlfriend, Sam (Cynthia Watros). Timing is everything -- Jennifer Grey ("Dirty Dancing") Guest Stars. 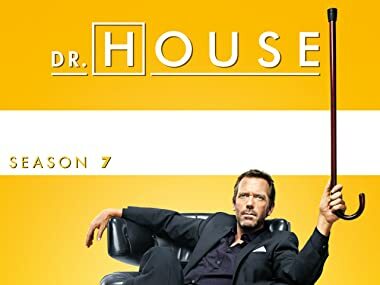 House (Hugh Laurie) finally hires a female member of the team, a third-year medical student (Amber Tamblyn) who, it turns out, has a tie to Taub (Peter Jacobson). Meanwhile, a senatorial candidate's campaign manager (Jack Coleman) suddenly falls ill, and the team must look to the candidate (Pat Finn) for clues about his condition. A girl is suspected of having smallpox after a 200-year-old medicine jar found in a shipwreck shatters in her hand, so a CDC doctor (Dylan Baker) locks down the hospital. Martha Masters (Amber Tamblyn) questions his motive for doing so. Meanwhile, Wilson (Robert Sean Leonard) and Sam (Cynthia Watros) examine their relationship after they comfort a 6-year-old cancer patient (Devon Woods). A man (Kuno Becker) falls ill after reenacting the Crucifixion; Taub (Peter Jacobson) questions his wife (Jennifer Crytal Foley) about her relationshwip with a member of an infidelity support group; Wilson's (Robert Sean Leonard) relationship with Sam (Cynthia Watros) takes a sudden turn after they attend a co-worker's wedding. A hero (Matthew Lillard) collapses moments after risking his life to save a stranger who fell onto subway tracks. Meanwhile, House (Hugh Laurie) tries to avoid Cuddy's birthday dinner because her opinionated mother (Guest star Candice Bergen) will be there; and Masters (Amber Tamblyn) helps Taub (Peter Jacobson) realize that he must take action on his crumbling marriage. House (Hugh Laurie) and the team try to link symptoms of a teenage military recruit and his drill sergeant (guest star Sasha Roiz); House secretly helps Cuddy's (Lisa Edelstein) daughter get into a prestigious preschool; someone posted a disparaging photo of Chase (Jesse Spencer) on a social-networking site. Family ties cause a conflict of interest. Candice Bergen ("Boston Legal") and Paula Marshall ("Gary Unmarried") Guest-Star. House (Hugh Laurie) participates in a school career day---and breaks rules by sharing explicit medical stories. Later, two fifth graders (guest stars Austin Michael Coleman and Haley Pullos) assess House's relationship troubles with Cuddy (Lisa Edelstein) , and try to help him understand the role that his selfish antics play in them. Career and happiness are called into question. Cuddy is faced with a new reality. A bullfighter is admitted after being attacked by a bull, and Masters (Amber Tamblyn) develops a crush on him as his condition inexplicably worsens, with miniseizures that can't be explained. Meanwhile, House (Hugh Laurie) is away from the hospital, tending to other issues. A young homeless man with a history of drug abuse (and a secret) arrives at the hospital with bad burns and scars on his chest. Meanwhile, Cuddy (Lisa Edelstein) tells Wilson (Robert Sean Leonard) that she feels guilty about breaking up with House (Hugh Laurie). Thirteen reappears (Olivia Wilde). It seems that she has just been released from prison, and House (Hugh Laurie) wants to know why she landed there. He seeks answers as they team up in a spud-gun competition. Meanwhile, the team treats a science teacher with a respiratory illness who turns out to be a hoarder; and Taub (Peter Jacobson) dips his toe into the dating pool. Thirteen (Olivia Wilde) rejoins the team, but Masters (Amber Tamblyn), who's completing medical school, might leave it to prepare for a surgical career. But first the team must diagnose a 16-year-old girl who collapses just before she's scheduled to begin sailing around the world. Cuddy's mother (Candice Bergen) considers filing a malpractice suit against the hospital, which could put her daughter's and House's (Hugh Laurie) medical licenses in jeopardy. Meanwhile, luck runs out for a lottery winner (Donal Logue). House (Hugh Laurie) attempts to resuscitate the career of a washed-up boxer (Kevin Phillips) following a disputed wager with Wilson (Robert Sean Leonard). Meanwhile, the team suspects that House might have another kind of drug problem. Thirteen (Olivia Wilde) has a friend in need: an ex-con (Amy Landecker) with an urgent medical problem that can't be treated at the hospital because it's drug-related. So they turn to Chase (Jesse Spencer) in desperation. Meanwhile, House(Hugh Laurie) deals with devastating information; and Taub (Peter Jacobson) comes to terms with an unexpected development. Life imitates art in the season finale.